Tooth Decay In Valrico? Cosmetic Dentistry Can Help! « This Is The Year For A New Smile! At Five Star Dental Care, we restore decayed teeth to create smiles that are both healthy and beautiful. Recent advances in both techniques and materials have made the ‘impossible’ not only possible, but affordable for everyone in Valrico as well. Dr. Jeff Bynum has been restoring teeth since 1996. Ongoing training is essential for staying on the cutting edge of the cosmetic dentistry industry. Decay is the most common Valrico dental problem and the second most common disease in the nation (number one is the common cold). If you have one or more teeth with decay, it’s time to take care of them. 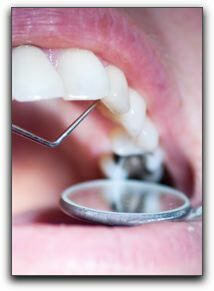 Fillings, inlays, onlays and crowns are used to restore teeth for our Valrico area cosmetic dental patients. Even the most basic procedure – filling a cavity – has evolved. There are several types of new materials available including porcelain and composite resin. Each has specific strengths and aesthetic considerations. Valrico patients who replace silver amalgam with tooth-colored fillings love getting the metal out of their smile. Inlays and onlays are more extensive restorations. There are two types: direct or indirect. Direct inlays and onlays are made in your Valrico cosmetic dental office on the spot and applied in one visit. Indirect inlays and onlays are fabricated in a nearby dental lab. They usually require a second visit but the results are well worth the extra trip. When a Valrico client has a tooth that cannot be restored with an inlay or an onlay, a natural-looking dental crown is the answer. At Five Star Dental Care, we create crowns that blend in perfectly with the rest of your teeth. Let us show you some photos of patients who have received smile makeovers – you will not see any “Chiclet” crowns that stick out like a sore thumb. In fact, you won’t be able to tell which of our Valrico dental clients have crowns. Five Star Dental Care is located at 3203 Lithia Pinecrest Rd in Valrico. Dr. Jeff Bynum is currently accepting new patients. Call 813-653-2273 to schedule a consultation with a restorative dentist. This entry was posted on Friday, January 13th, 2012 at 10:23 am	and is filed under Cosmetic Dentistry. You can follow any responses to this entry through the RSS 2.0 feed. Both comments and pings are currently closed.